The Battle for the Cloud! 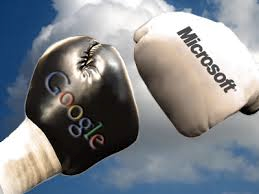 In this corner we have Microsoft, in this corner we have Amazon, and in our final corner is Google. Yowza the big boys are at it again. And yes I know there are not 3 corners in a boxing match…work with me people! Despite its hype, the cloud still accounts for just 4.8% of the overall enterprise IT spend. Gartner estimates the worldwide market for public cloud services for 2013 to be at $129billion, representing less than 5% of the total IT market of $2.7trillion in 2013. Now that is something to fight over! Amazon Web Services (AWS), the incumbent, is losing traction as Google and Windows Azure convince large enterprise clients access to their private, public and hybrid cloud offerings. Google recently cut storage prices for the second time in a week. This only a day after Amazon cut its S3 storage prices by 25 percent. Hit’em in the pocket boys, just keep it above the belt! Microsoft on the other hand has some work to do to keep up with the competition. They no longer can be stuck in Windows world. They are working feverishly to welcome non-Windows-oriented toolsets and languages. The rumored launch of Office for the iPad could help put to rest the Windows only mindset that Microsoft has embraced for decades. Way to come out of the box Microsft, hope it isn’t too late the fight started years ago! So how will this battle pan out? Only time will tell. But isn’t it fun to watch these megalomaniacs fight to the bitter end! Okay not the bitter end because let’s get real…they all win in the end!